A hurricane tracking over the Caribbean. © CDKN. Governments in the Caribbean recognise climate variability and change to be the most significant threat to sustainable development in the region. Policies and strategies such as the regional framework for achieving development resilient to climate change and its implementation plan acknowledge the scale of the threat and provide a plan that aspires to safeguard regional prosperity and meet development goals. To do this, decision-makers need effective tools and methods to help integrate climate change considerations into their planning and investment processes. To build resilience, decision-makers can benefit from access to appropriate climate change data that are specific to their geographical location and relevant to their planning horizons. 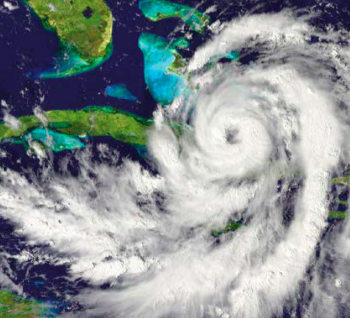 The CARibbean Weather Impacts Group (CARIWIG) project, funded by the Climate and Development Knowledge Network (CDKN), gives access to climate data that have been downscaled, making them relevant for use in the Caribbean region. Historical climate data from a network of weather stations across the region. Regional climate change projections, provided at a resolution relevant for decision-makers at the national level in Caribbean countries. Projections of how the climate may affect local weather at specific locations across the Caribbean region. Simulations of historical tropical storms along user-defined paths. The Caribbean Assessment of Regional Drought (CARiDRO) tool. CARIWIG provides 30 years’ of historical climate data from a network of weather stations across the region. This covers monthly averaged rainfall, rainfall amount on wet days, the proportion of dry days, sunshine duration, daily maximum and minimum temperatures, vapour pressure and wind speed. These datasets are useful for providing baselines against which to measure future change and examples of previous weather conditions experienced in the Caribbean.  Countries included in the CARIWIG dataset include Antigua and Barbuda, Barbados, Belize  Cuba, Dominica, Grenada, Guyana, Jamaica, Saint Lucia, and Trinidad and Tobago. Future projections provide regional climate change projections at a resolution relevant to decision-makers at the national level in Caribbean countries. A critical output from the CARIWIG project has been the online collation of regional climate change projections generated using a regional climate model known as ‘Providing REgional Climates for Impacts Studies’ (PRECIS). The CARIWIG data portal provides access to these projections for the Caribbean region, covering 12 climate variables (see Table 1 on page 6 of the report). Summary of the variables covered in the PRECIS regional climate model (Table 1, page 6 of the report). The weather generator provides projections of how the climate may affect local weather at specific locations across the Caribbean region. It provides daily weather time series (usually at least 100) for use in impact assessments and impact models. It generates weather data for the future at single locations – at each of the existing weather stations (see Figure 1). This means the future weather time series can therefore be compared directly with historical weather observations at each weather station location. Map showing the dstribution of weather stations recording daily minimum temperature (1971-2000) (Figure.1, page 2 of the report). The tropical storm model allows users to generate simulations of historical tropical storms along their own (user-defined) storm tracks across different Caribbean countries. The tool then runs a simulation of memorable past storms (such as Hurricane Dean) along the predefined track. The model generates precipitation rates and wind speeds on grids at 15-minute intervals. While this tool is not available through the CARIWIG data portal, it is still based on the same RCM data. CARiDRO is an online tool that allows users to process observed and modelled climate data based on two drought indices: the Standardized Precipitation Index (SPI) and the Standardized Precipitation-Evaporation Index (SPEI). It allows users to assess both atmospheric and hydrological drought and has been applied to assess the likelihood of drought events and to investigate the relationship between drought incidence and agricultural forest fires. The online CARIWIG portal provides climate data, including historical climate data and future projections, that are relevant to the Caribbean region and that are available for a range of climate variables. This includes a suite of simulation tools, including a weather generator, a tropical storm model and a regional drought analysis tool are also freely available. The suite of CARIWIG tools provides a powerful resource for Caribbean decision-makers. The downscaled climate change projections provide information about possible future climate on a spatial and temporal scale that is relevant for decision-makers in a wide range of sectors, including tourism, health, agriculture, and coastal zone management. CDKN research has shown how the regional climate model data can be applied in practice to real-world situations in a variety of Caribbean countries. These case studies (summarised on pages 8-10 of the report) demonstrate how the climate projections – and associated simulation tools such as the weather generator, the tropical storm model and CARiDRO − can be used in conjunction with other tools such as crop models to provide new insights about the impact of future climate change in the Caribbean. Decision-makers should be aware that the downscaled data do not provide increased certainty. In light of this, the CARIWIG regional climate model data should be considered as only one source of information – to be assessed alongside other projections, including the latest global climate model ensemble of projections. Given the uncertainties, Caribbean decisions-makers should focus on identifying and implementing adaptation actions that perform well over a wide range of conditions (robust options). This means identifying ‘no regret’ and ‘low regret’ options that can deliver benefits in the near term as well as laying the foundations for addressing future climate challenges. An important principle for decision-making in the face of uncertainty is to apply adaptive management. This promotes strategies that evolve as new evidence becomes available or circumstances change. In practice, this might mean periodically reviewing climate change allowances used for engineering design in the light of new developments and climate model experiments. CDKN-funded tools such as the Caribbean Climate Online Risk and Adaptation TooL (CCORAL)(see Box 3 on page 7 of the report) and associated sourcebook for the water sector are particularly instructive on how to make effective decisions about climate change in the face of uncertainty - those that will perform well under a range of climate scenarios and that often provide important additional benefits to societies and economies. The Caribbean Community Climate Change Centre (CCCCC) is providing training and support on how to use CARIWIG outputs. CDKN, 2017. Climate data and projections: supporting evidence-based decision-making in the Caribbean. CDKN OPINION: The IPCC’s Fifth Assessment Report: What does it mean for the Caribbean?